To purchase this product follow this link to our eshop and scroll down to veterinary products. A product containing unique fish oil, which is the most important natural source of a number of unsaturated fatty acids and vitamins A, D a E. It significantly enhances the immunity, helps to build up strong bones and healthy teeth and to maintain healthy skin, hair, and eyes. The naturally lower content of vitamins A and D eliminates the danger of overdose with these vitamins. - A source of unsaturated fatty acids (omega, EPA, DHA) – for cellular membranes, nerves, hormones, cholesterol metabolism [Gynevet]. - A safe source of vitamins A, D and E.
- For shiny hair, skin quality and elasticity [Gynevet]. - For the recovery of cellular immunity in older animals – warts, small benign tumours [Imunovet, Gynevet]. - For overweight, steatosis – fatty infiltration of organs [Gynevet]. - For bone, tooth and eye strengthening [Kingvet, Renovet]. - For enhanced immunity (bacteria, tumours), specifically for tonsillitis [Imunovet, Renovet, Kingvet]. - A suitable supplement for ageing animals. Oil of the sea fish Engraulis japonicus (500mg) [containing eicosapentaenoic acid (EPA) – min. 38%, docosahexaenoic acid (DHA) – min. 25%] - 99.5%, vitamin E - 0.5%. Animals over 50kg: 5 drops for every 50kg of weight 1-3 times a day. The product should be discontinued after 3 weeks for the period of one week. May be administered in titbits or mixed in foodstuff. It is recommended to use the product within three months of opening. Do not exceed the recommended daily dose, particularly in gestating females! Ensure sufficient intake of water in the course of product usage. Keep out of reach of children! Store the product in dry and dark environment, at 10-25°C. Do not freeze. Minimum shelf-life specified on the box and label. The product was developed, manufactured and controlled in compliance with the requirements set forth by the ISO 9001:2008 standard. 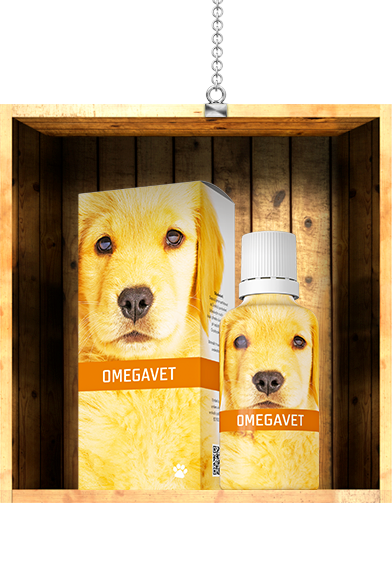 I use Omegavet for the treatment of skin diseases; combination with Peralgin has been successful in the treatment of atopic conditions. Vitamin E, EPA and DHA help enhance the immunity, and for this reason I use the product also in the therapy of demodicosis.